So far, we have replaced the round fluted columns to sleek square pillars (HERE), and replaced the ceiling molding with lighted cove molding (HERE). Next, we are tackling the fireplace. Again, not our style. The mantel is overly ornate and had been faux painted by the prior owner. The fireplace itself is unique and presents challenges since it is inset into the wall. Typically fireplaces are protruding from the wall. The fireplace is double sided, a feature we definitely like. To get a transitional style, we will bring in stone, wood panels, and raw wood. First step is to remove the wooden fireplace mantel and side corbels. Removing the mantel was a tough job, pieces of drywall came off during the process. To remove the marble tiles, we cut out the drywall, which is easier than trying to peel the tiles off the drywall. This is the perfect time to install a wall mount for the TV, I’ll talk a bit more about that later on in this post. We installed Sheetrock and mudded the area well. Sheetrock has fire resistant panels, and is safer to use around a fireplace than regular drywall. For the surround, we chose a black/silver stacked stone or ledger stone, similar to this one (HERE). These pieces are great, come in 6 x 24 inches and don’t require grouting. We decided to remove the marble stone hearth on the floor. We want to continue the hardwood boards in the room up to the fireplace. We have a few piece of the original hardwood we found lying around, and hoped to be able to use them in the hearth area. We don’t want to rip up a lot of the existing hardwood, but want to get a uniform look, and have the new wood blend in with the old wood. After several failed attempts to try to piece this together, we decided to buy a new box of hardwood to get the perfect blend. We pulled out some of the old boards and added new boards staggering the pattern. It turned out better than I expected. There is a slight variation in color, but that’s to be expected with new hardwood. To the space above the stacked stone, we added primed 8″ boards and painted them the same color as the pillars. 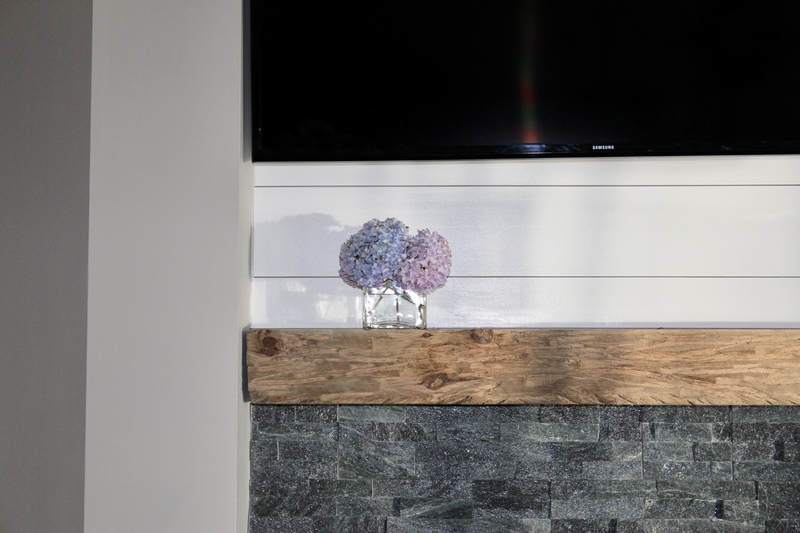 For the mantel, we bought a rustic piece of timber (SIMILAR HERE) which was very easy to install since the mounting hardware is included. In addition, the black metal on the glass insert is showing its age. I got a bottle of heat resistant paint to give the rim a clean look (HERE). Notice the black rim around the glass is looking worn. A fresh coat of paint brightens it up dramatically. Took less than 10 minutes to do and looks so much better. I used a brush like this one (HERE). The fireplace surround is complete! The TV is mounted to the wall using a SANUS mount (HERE). We buy all our TV mounts through Amazon and have been more than satisfied. We like to be able to tilt the tv and pull it out of the wall and move it left or right if we choose. The planked boards above the stone give the fireplace a transitional look. The hardwood blended with the existing wood pretty well. Another project complete! Thanks for stopping by and please share the post on FB if you like it. Also follow along in Instagram!